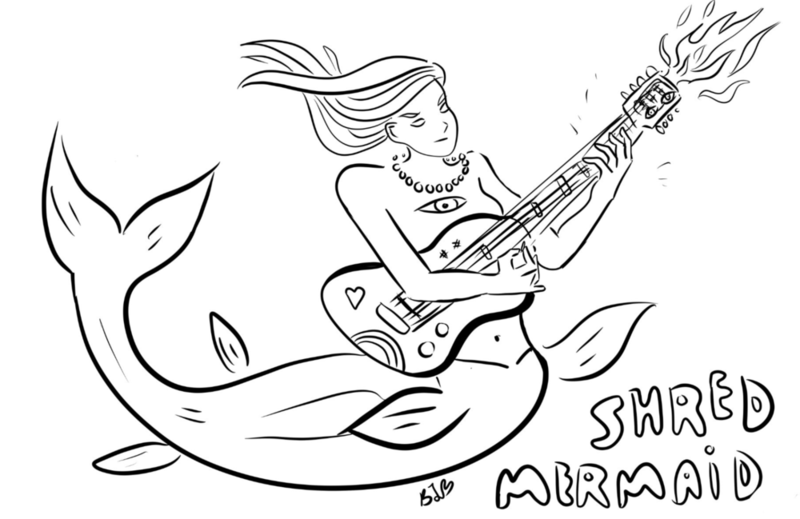 Who knows, I feel Shred Mermaid should get her own comic. She seems like she would have lots of cool adventures and many tasty licks and sick arpeggios. I found another captivating monster from the past to capture while visiting New York City. The Metropolitan Museum of Art has this amazing version of The Book of the Dead, a scroll of something like 40 feet. While walking along this scroll in the Egyptian wing, this scarab beetle with falcon wings stood out to me. First of all, the beetle in this illustration is huge, it's bigger even than the female goddesses at its feet. Compared to gods with female bodies and cat heads or gods like Anubis, this beetle doesn't seem very cool, but the longer I looked at it, the more novel it seemed. I started really thinking about what a beetle with large birds wings would look like, but, what if I drew this in more of a realistic style? The first version I came up with was this piece, where the beetle seems to be just coasting through the air. This piece looks very close to the original beetle in The Book of The Dead. I started another drawing where the beetle's actual beetle wings open up to reveal not a translucent insect wing, but a flowing set of bird's wings instead. It was a fun challenge to combine the anatomy of a beetle and a falcon in a way that seemed believable. I added a figure to this version of the eagle-winged scarab for scale - this is about as large as the goddesses were in the illustration from The Book of The Dead. I couldn't get over the mummy's face and how the weaving was so elaborate. It was hard to tell if the weaving started on the outside and worked inwards, or if the weaving/wrapping started on the inside and moved out. Check out the page for the Inka exhibit here! There is a cool video of the Book of the Dead here.